A couple of weeks ago, the Wall Street Journal reported the possibility of Google partnering with multiple OEMs to create five versions of this year’s Nexus smartphone (Droid-Life article for those who cannot access the full WSJ article). For those who don’t know, Google for the last three years partnered with a single OEM each year to create and manufacture its flagship Android smartphone for the year, the Nexus. The Nexus each year launches with the latest version of Android Open Source Project (AOSP) version of Android, called “vanilla” by Android fans since it does not feature an OEM skin. In addition, the Nexus is usually updated directly by Google, ensuring the latest version of Android is running. Recently, this trend has been broken by carriers such as Verizon with last year’s Galaxy Nexus and Sprint with 2010’s Nexus S. Many fans of Google’s Nexus program criticize any Nexus whose updates are bloacked by carriers, refusing to consider them a true Nexus phone. The Galaxy Nexus, which released on December 15, 2011, has yet to receive an update to Android 4.0.4, which has already been pushed to the GSM variant. Google’s first Nexus in 2009, the Nexus One, was sold directly by Google and usable on GSM networks. This strategy did not work very well and Google then partnered with carriers to sell their phones to the end customer; first with Sprint and then adding Verizon. However, as noted before, Google began to run into update problems with carriers, leading them to try, once again, to sell phones through their Google Play store. Currently, the GSM version of the Galaxy Nexus, the version supported by AOSP, is offered by Google to be used on AT&T and T-Mobile for $399. While many Android enthusiasts are excited about Google selling affordable handsets directly to end users free of contract and free of the red tape carriers create – a true Google experience phone – I, for one, am wondering about the merits of creating 5 different devices. Sure, I’d love to see more “vanilla” Android smartphones out in the world and this does get around the OEM bias Google has been facing ever since it bought Motorola Mobility, a deal that has finally been approved by Europe, the US, and China. However, the best thing about a Nexus phone is not the quick updates from Google. It’s the development community that crop up and surround these devices. A Nexus is well known for being easy to unlock the bootloader and provide root access, allowing consumers to flash new ROMs onto their phones. These ROMs, depending on the developer, are highly customized, use the latest AOSP build, and bring more features than plain “vanilla” Android.. Users who have some knowledge of how to flash their device with a ROM (it’s really not very hard) can have the latest version of Android before the carriers get around to releasing the OTA update. In the past, these developers only had to work around one set of hardware. Sure, things are a bit more complicated with the GSM Galaxy Nexus (Maguro), Verizon CDMA/LTE Galaxy Nexus (Toro), and the Sprint CDMA/LTE Galaxy Nexus (ToroPlus), but all of them have essentially the same hardware. Same screen, same TI OMAP processor, same build and functionality. Perhaps the only real difference is the radios and the parts of the software needed to build CDMA for Verizon or Sprint versus GSM, which many developers take directly from a stock image of the phone. Note I don’t build ROMs, so I have very limited knowledge about this, so please feel free to correct me. Now, what happens if this development community was split among five devices? Google hasn’t provided any details about this rumor, but it’s highly likely that all of them will have their own hardware specifications. Some may use TI OMAP, others Qualcomm Snapdragon or Samsung’s Exynos. With such variety, there will probably be some “growing pains.” Sure, ROMs like roman’s AOKP are built for a wide range of devices that use different processors, but not every ROM is an AOKP. 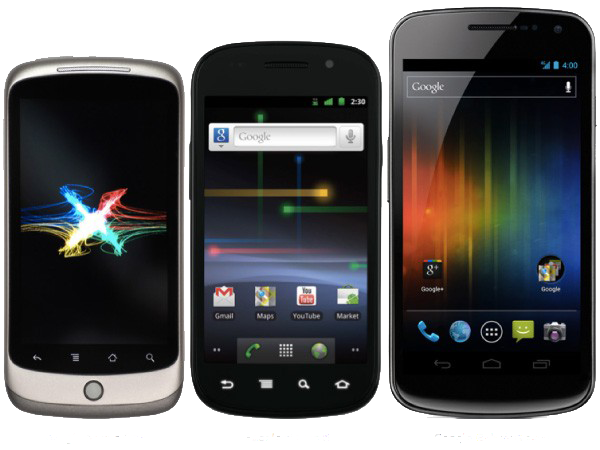 I fear having five Nexus devices for 2012 will “fragment” (I know, Android fans hate that word) the development community. At some point, one of the five devices will become the preferred Nexus – the Nexus to rule them all. Heck, having all five “vanilla” Android devices launch at the end of the year with Android 5.0, Jellybean, will be too much “vanilla” for a single time period. All of this is speculation at this point. For all I know, the Wall Street Journal is off here and there will only be one Nexus device again. Or maybe the “five devices” include one GSM variant, one GSM/LTE variant, one LTE/CDMA Verizon variant, one CDMA/LTE Sprint Variant, and some other variant. However, that wouldn’t explain the report specifying multiple OEMs being involved. Google already had trouble managing AOSP updates with its limited number of devices as is. I really cannot imagine it supporting five new devices this year; not to mention how this will affect the development community. At this point all I and fellow Android fans around the world can do is wait and see what Google announces when its finally ready to unveil Jellybean. 2012 is a big year to look forward to with Google’s first tablet device to be unveiled at I/O in June and the potential for a feast of Nexus smartphones with Jellybean come Fall. Hopefully this move, if true, is for the best and avoids alienating Nexus Android fans – both GSM or CDMA/LTE fans. Edit: After reading through some forums, there’s speculation that the five devices include both tablets and smartphones. Adding tablets to the equation can take care of two of the five if one is a ~7″ tablet and the other ~10″. However, the last I read about the “Nexus” tablet was that it is aiming to compete on price with Amazon’s Kindle Fire, which took the tablet market by storm late last year. Being able to have an attractive price tag will mean sacrificing screen real estate and other less necessary parts such as cameras.